As this year’s International Women’s Day strongly calls for #PressforProgress for gender parity, we take one example from Habitat EMEA region that has committed to putting young schoolgirls and women at the heart of their Water Sanitation and Hygiene (WASH) initiatives. Water supply, sanitation and hygiene (WASH) are prerequisites of an effective education. Without adequate WASH facilities, not only does the quality of education suffer, but also some students, especially girls, may be discouraged from attending school at all. WASH in schools plays a significant role in achieving most of the UN’s Sustainable Development Goals (SDG 3- reducing child mortality, SDG 4 – achieving universal access to primary education, SDG 5- increasing gender equality and SDG 6 – clean water and sanitation). Photo: Part of Sanitation and Hygiene promotion campaigns. 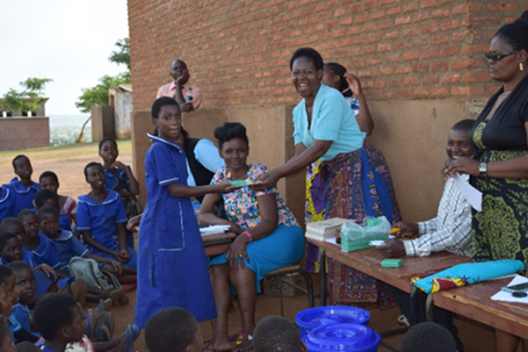 Schoolgirls receiving prizes after quiz was conducted on sanitation, hygiene, and menstrual hygiene management. Poor access to school water, sanitation and hygiene education is one of the factors that affect young girls who have reached adolescent age. Under normal circumstances, young adolescent girls need more time and privacy to take care of themselves and this is not always possible if they have to queue for the toilet. 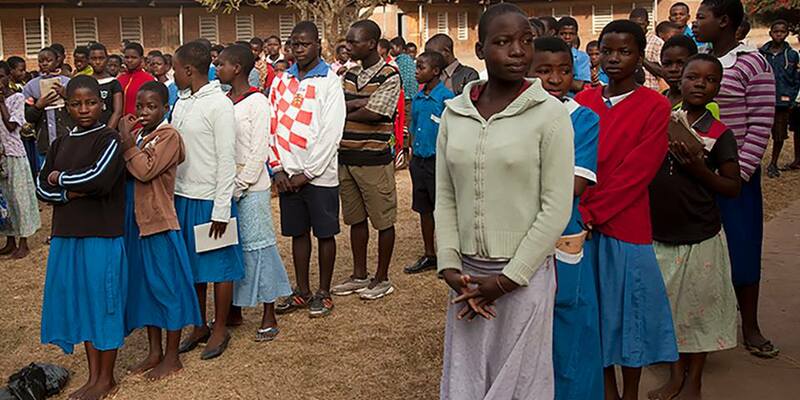 As a result, absenteeism and dropout rates are high when the girls are menstruating. In recognition of these challenges, Habitat for Humanity Malawi has worked collaboratively with multiple stakeholders from the public and private sectors to enhance the well-being of schoolchildren, especially adolescent girls in primary schools, in low-income peri-urban areas of Lilongwe, Malawi. The initiative has ensured that the girls in the target schools have separate girl friendly sanitation facilities, water for washing and promoted adolescent girls’ hygiene through menstrual hygiene management (MHM). The initiative also distributed re-usable sanitary pads that can be used for a maximum of 3 years. In order to ensure effectiveness and sustainability of the MHM and hygiene component of the initiative, Mother Groups from the surrounding communities have been established and strengthened through trainings including making of sanitary pads. Mother Groups are community-based clubs that mobilise mothers who are mainly parents or guardians of the girls in the target schools and include other female figures in the surrounding communities. The Mother Groups help support girls going through puberty and they are key to addressing the issue of female dropout and absenteeism. Today, we recognise these Mother Groups and all women (including female teachers, facilitators and health surveillance assistants from the government ministry of health) who were involved in this initiative as they are focal points in driving its success. We also take the opportunity to celebrate all the women globally who are making social, economic, cultural and political impacts. As we celebrate this important day, we encourage you to be inspired by examples of positive behaviours in maintaining a gender parity mindset that takes inclusiveness as a central point of our efforts in making the world a decent and better place to live.